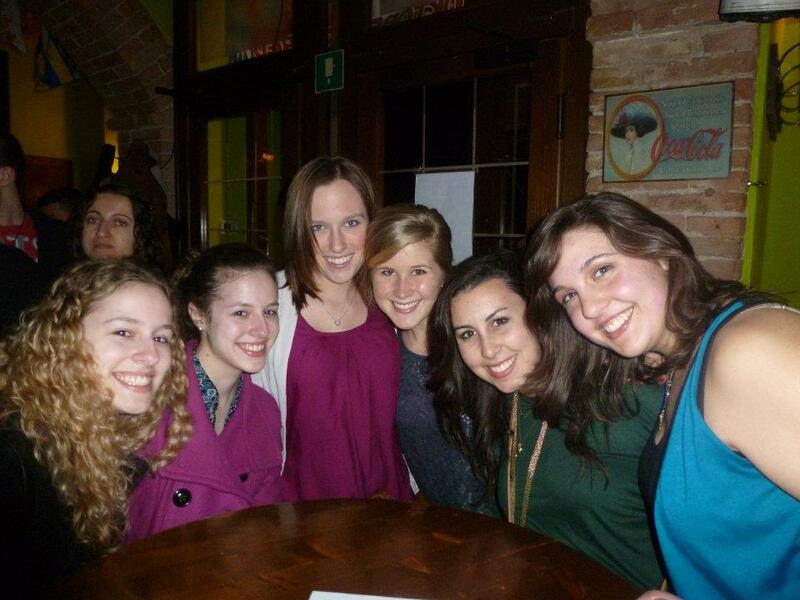 Tuesday was the day I was anxiously awaiting because it was the day that my family arrived in Siena. I love Siena, but I wasn't sure I could do it justice when they visited. Cesca had been for a short visit, but I wanted them to see how nice life is here. After their bus got in a little bit late (and after some confusion as to their location- I assumed bus station, apparently the bus stopped at the train station) I took them to their hostel, which is the floor below me, conveniently. It wasn't the best hostel ever (I got stuck in the bathroom when I was down there because the lock was dumb) but it was only for one night. After they were settled, we headed off to Il Campo for a bite to eat and relaxation, with me explaining Siena along the way. I may hate my Art History class, but it has given me some fun facts and valuable information to share with people. We got pizza and sat in the Campo in the sunshine, which is one of my favorite things to do here. We even saw a wedding! I showed them the IES center where I go to school, where Mom and Cesca were greeted like heroes because of the gift they had brought with them: Oreos. Everyone had been craving them (some even went as far as looking up shipping costs) so I asked them to bring a pack over. Needless to say, I was very popular that day. Afterwards, I had class so Mom and Cesca wandered over to the Duomo to see it's awesomeness. I met them near Il Campo and bought them nutella pies, my favorite snack, and we headed home to meet Paola. factors leading up to the Black Death! Yay! Paola has been super excited to meet my mom, and vice versa. The difficulty lies in the fact that they don't speak each other's language. Enter me: the translator. It was a wonderful dinner where I had to talk most of the time to translate between one or the other, but it was fantastic! Paola went all out with her cooking and it was delicious! I even liked her spinach, and I hate spinach. It was lovely having my two moms together at one table. Mom and Cesca brought Paola a small elephant statue as a gift (in Siena, the perfect gift for anyone is something with their contrada on it) and she was very happy and insisted they didn't have to get her anything. Moms in any culture are so similar! We skyped my dad for a little bit since I have internet access that they had been lacking for the last few days, and then my mom headed to bed while Cesca and I headed out to karaoke night with my IES group. It was so much fun and almost everyone came. I'm happy she got to meet the people I chill with here. We sang everything from Mamma Mia to Lady Gaga to the YMCA (and that includes that popular Portuguese song I was telling you about- Cesca thought it was a strange song till everyone at the bar did it. Then it's awesomeness finally made sense). After staying up and chatting for way too long, Cesca and I headed to bed. Paola had a full breakfast spread for us in the morning, where I again was the interpreter (I admit I enjoyed this job a lot) and then Paola dropped me off at school and them at the bus station. They were heading to Rome to spend the day looking at the Vatican Museum while I diligently learned about Ambrogio Lorenzetti's frescos that depict the effects of good and bad government. Yeah. So after that intriguing lesson (actually, to be fair that one was pretty interesting) I hopped on the train to Rome to meet them at their hotel. We had an early start in the morning, so we turned in early so we could be ready for our next big adventure: Southern Italy! Breakfast is calling my name, so I'll update more later! Ciao for now!